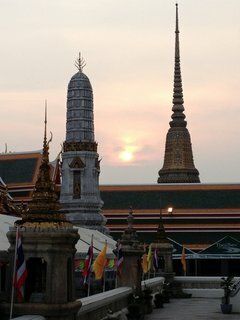 Can’t believe I forgot to upload the photo of the sunset at Wat Pho and include it in my previous entry about the afternoon trip to Bangkok temple. Have gone ahead and added it into that entry, but for those of you who already read the entry, I will include the picture here so you can enjoy it. Shot by an iPhone 4s – pretty impressive, no? You have me itching to buy a plane ticket, sir. As I’ve never been outside of the US and Canada, I find the architecture intriguing. It would be neat to visit BKK again w/ J. @ElusiveWords – Would be a pleasure to show you both around and have you over for dinner. @Crystalinne – Definitely different than what you would find there! @Grannys_Place – @Fatcat723 – Glad you enjoyed@chronic_masticator – Now’s as good a time as any.